Home Domestic News Is Manchester United’s Dormant Transfer Volcano About to Erupt? The transfer season is renown as the ‘silly season’ because of the absurd transfer rumours that are fabricated by supposedly respected newspapers and the laughable transfer rumours that spread like a forest fire on social media such as twitter. It seems most of the craziest rumours concern Manchester United every year and this year is no different. Messi, Ronaldo, Ozil, Kaka, Fabregas, Bale all have been linked with United this year – rumours that make football fans think either that journalists are drunk when they write articles or that football managers are playing a video game of their namesake ‘Football Manager’. Some transfer names, even though they sound really unlikely may not be impossible, well other than Messi, any of the aforementioned names could all potentially be the ‘Marquee Signing’ Sir Alex Ferguson said United could be able to buy this summer. Cristiano Ronaldo to Man United rumours have been rampant ever since he tweeted “All the news about my renewal with Real Madrid are false.” All summer, some respected journalists have pulled at the heart strings of the masses of United fans be suggesting a Ronaldo return may be a possibility, similarly however some respected journalists have contradicted the others by saying that Ronaldo will sign a contract renewal and that Ronaldo to United is fairytale that will never come to fruition. Last night, just when football fans thought the Ronaldo saga was dying down, it was set alight yet again and this saga is hotting up once more. A BBC presenter called Dan Walker, who never talks or tweets about transfer rumours, tweeted; “4 different trusted individuals have all mentioned Ronaldo to #MUFC in the last 24hrs. Interesting…very interesting”. Of course this could so easily be a ploy to get more followers and divert attention his way. However he is a respected football presenter who is employed by the BBC, a company which is funded by tax payers and hence have to be neutral when it comes to footballing news etc so he has no real reason to lie or try to fool football fans around the world. One would assume the ‘4 different trusted individuals’ are from BBC and that would make these rumours a lot more credible – as BBC and Sky Sports are considered the 2 most reliable footballing sources. 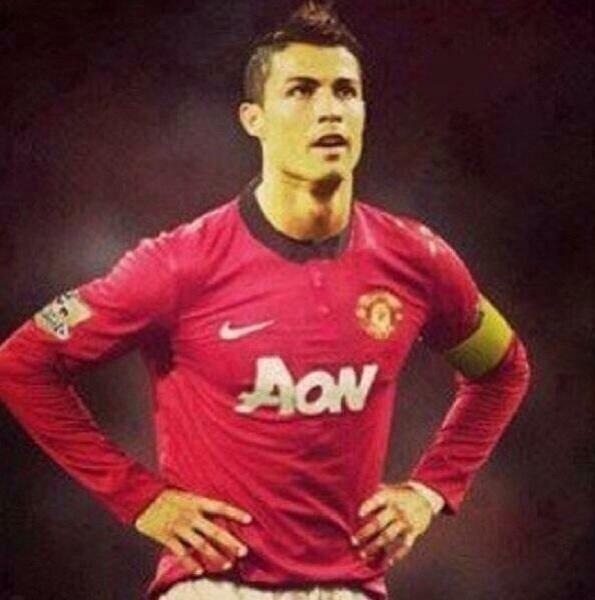 This rumour comes days after another rumour that stated Ronaldo was in Manchester early in the week. Antonio Valencia gave up the number 25 shirt supposedly because he was superstitious and after an awful season wearing number 7 felt that the shirt added too much pressure for him and was too iconic. This is the excuse given by Valencia himself, whether its the truth or not is yet to be seen, as this may just be a cover up to the truth of him giving up the historic number 7 shirt. Has he given up the shirt for an incoming player? Chevrolet, Man United’s sponsor that reportedly could be a part of funding a Ronaldo move have fueled things further by releasing a new car called C7-R just at the midst of these Ronaldo murmurs – as Ronaldo’s trademark of course is CR7. Is the new car a subtle hint that a return of the Portuguese sensation is on the cards (not Bebe)? It’s all wild speculation, but there can be nothing but speculation until the 2nd of September because the transfer window is all pure speculation until a player has signed on the dotted lines of a contract. Also last night a Sun Journalist and several freelance journalists who have worked for sizable newspapers have said that Manchester United are still very much interested in buying Marouane Fellaini and suggesting he could be signed before the Chelsea game. It was also suggested that a creative midfielder was also desired such as Modric, Ozil, Kaka, all Real Madrid players, as it is believed that if Real Madrid really want to break the bank to land Bale they have to level the spending books by selling a top player. One thing is for sure, it is very strange to say the least that any team does not have anyone wearing the number 7 and number 9 shirts at a football club, even more bamboozling that the club is Manchester United – with them being Champions and having such a iconic history of players wearing those shirts. For the last 2/3 weeks United have been deadly silent on the transfer front, with newspapers saying bids for players to go in and signings imminent, yet nothing has come out from Old Trafford. Something is brewing, I personally think its something substantial, Manchester United would not be naive and silly enough to upset their fans by buying nobody. It would be equally bizarre for them to panic buy in the last week and make a Javi Garcia / Scott Sinclair-esque crazy signing just for the sake of making a signing. So with the transfer window nearing its close – Its a matter of time before United make a good quality signing or two that will improve their squad. Whether those signings are a defensive midfielder like Fellaini and or a creative midfielder in the ilk of Modric, Fabregas etc. Or just one marquee signing of the ex United hero Cristiano Ronaldo. I think after being frustrated with the lack of transfer activity this summer, United fans will soon become big fans of Ed Woodward when he signs a couple of top players which may potentially help in bringing the League title back to Old Trafford for the 21st time.